We have access to over 45,000 products from over 1,000 suppliers. Our online catalogue contains a comprehensive selection of our major product lines and most popular items. Most of these are also available for purchase online. To assist you, our products can be searched by type, application or supplier. Our range of calibrators and calibration modules includes both single and multifunction devices from a number of vendors. We have primary reference standards for use in laboratories and as site standards as well as a huge range of field devices including units certified for use in hazardous areas. 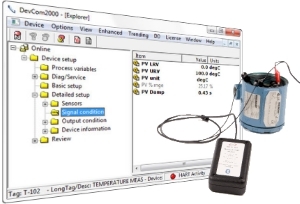 Field calibration of pressure instruments often requires a portable source of stable pressure. We provide hand operated pneumatic pumps capable of pressures up to 4500 kPa / 650 psi and hydraulic pumps up to 100 bar / 15,000 psi. Alternatively, we also have gauge comparators and pressure controllers to allow precision pressure control of compressed air or nitrogen in your workshop or laboratory. We offer a range of data acquisition and data loggers dependant on whether you want to view live data or record it for analysis. The nVision reference recorder from Crystal Engineering is an example of the best of both worlds, allowing you to view live data, scroll back in time and zoom in on a particular reading, and while you are doing so, the device carries on recording live data. Among the large range of digital pressure testing devices that we can offer, the Crystal Engineering XP2i and M1 digital gauges really are a cut above the rest. Highly accurate and very robust, we have literally hundreds of these in service which testifies to just how good they are. Give them a try, you won't be disappointed! We have everything from the humble multimeter or clamp meter to earth leakage testers, rotation meters and 15KV megohmeters. Our primary supplier here is Transcat in the US. If it's on their site, we can get it for you. If you are looking for Ex rated Fluke meters, you've come to the right place. Our supplier, Ecom Instruments, handles most of the modification and certification of these units, so we get them factory direct at competitive prices! Our range of gauges and meters designed to measure a wide range of variables such as thickness, distance, speed, vibration or sound level. Ultrasonic thickness gauges are commonly used to determine total thickness of materials, however some models also measure through, or the thickness of, coatings and also have the ability to detect very fine pits, flaws and porosity without having to destroy the materials or parts being tested. 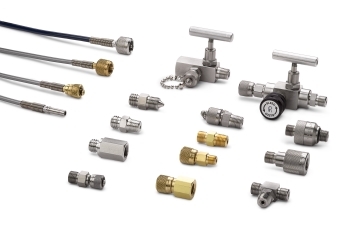 Our range of calibration valves, pressure controllers and manifolds are designed to make calibration of pressure instruments quick and easy. Soft seated valves allow dependable leak free control and precision machined parts provide smooth and precise pressure adjustment. You'll be amazed at the difference a proper vernier controller makes to the speed of your calibrations. Our selection of contact & infra-red thermometers ranges from basic, pocket-sized units through to hazardous area rated devices with data logging capabilities and temperature probes for surface measurements. The accuracy of IR thermometers is greatly affected by changing emissivity which is the amount of reflection of the infra-red beam. Look for a unit which allows you to adjust this if the surfaces of the material you are measuring vary between shiny and matt. Distance to spot ratio will also affect the distance from the item to be measured. The higher the ratio, the further away from your source you can afford to be. Calibrating instruments requires a stable, leak free connection. Good as they are for plant installation, using Swagelok or Gyrolock tube fittings to perform pressure calibrations isn't what they are designed to do. We stock the full range of Crystal and Ralston quick connect hoses and fittings with interconnects to your plant tube fittings. 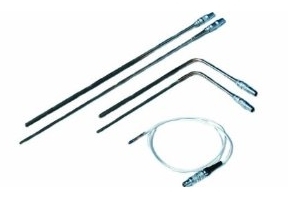 If you're after a complete source and connections kit, have a look at one of our Transtek pressure calibration kits. We can customise these to suit the calibrator or gauge you're using. Just give us a call.. Along with field communicators from Emerson and Meriam we supply the latest Bluetooth HART® modems from MACTek (the Viator series) and ProComSol, as well as the older hard wired USB and RS-232 variants. If you're looking for a smart and flexible alternative to a single purpose HART® communicator we also offer software for Windows® and Android® devices, allowing you to turn your PC, tablet or smartphone into a HART® communicator for a fraction of the cost. Our range of camera and mobility products for use in potentially hazardous areas are all IECEx certified to either Zones 1 or 2 for use in Australia. These products are at the forefront of enhancing mobility for workers in the oil and gas industry, chemicals, mining, and allied industries. They allow improved communications and efficiencies which reduce operational costs, but far more importantly allow an increased level of safety for those challenged with some of the most arduous and dangerous working environments. Whatever your needs for mobile communication devices in hazardous locations may be; we have the right solution for you. Our cell phones, headsets and remote speaker microphones are suitable for use in IECEx Zones 1 & 2 and carry Australian RCM or 'A' Tick and 'C' Tick approvals. These are truly ruggedised industrial devices with features such as dust and submersion-proof housings, reinforced Gorilla Glass™ displays, loud ring capability and strong vibration alerts for use in noisy environments. After so many years in the market, we are the only supplier to offer a 3 year 'No Questions Asked' warranty as an option with every phone that we sell. High quality, industrial, submersible and hazardous area (Ex) approved flashlights and torches. We offer everything from micro keyring sized units to those intended for helmets, small and large torches and wide area lighting systems. The Ecom range are specifically fitted with safety features such as a warning to ensure you have enough light to get you out of a hazardous area as the batteries decay and standby LEDs should the normal LED light source fail.